Now Flat Betty lived with her mother, Maude, and worked at the Ding Dong Dinner Diner. Her current heartthrob, Harley Hoyt Holcomb, had been about to ask her to marry him but then there was that incident at the Fourth of July parade. HH decided to sew some wild oats first and ran away to become a circus clown. 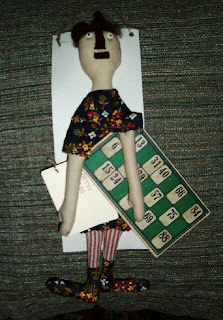 Flat Betty was devastated, and rather than sit home with her mother, who kept nagging, “Ya HAVE to do SOMETHING about that hair!” she started playing bingo. Now if Rev. Flugle from The Holiness Church of the Sacred Glade KNEW that Flat Betty was playing bingo every Friday night, why he would just have a FIT! But he didn’t know. So every Friday when she got off work, she dressed up, put on her purtiest bright red lipstick (for luck), fluffed up her hair as best she could, and set out to WIN, WIN, WIN! She had her special card with her lucky numbers on it. By the end of the night she lost every tip she had made that day. But our Betty didn’t give up. Her motto was: “I always say if it’s worth doing, it’s worth over doing!” So she did. Now y’all, one Friday night Bubba (who had a big old crush on Flat Betty) talked her into giving him a teeny good luck kiss. And Betty bingoed FIVE times in a row! WELL, she started taking a little more notice of Bubba. And now she and Bubba are an item in Tweed Town and play bingo most every Friday night. MORAL OF THE STORY: It takes more than lucky numbers to win at bingo and men named Bubba aren’t particular about hairstyles! Does Bubba Have a Brother? I'm available! "If it's worth doing, it's worth overdoing!" Hey Jill sweetness, it was nice of you to stop by. Love what you have done to your blog and title very awesome, I love!!!! Well sweet lady have a great night! Oh no. No more Flat Betty stories? Back to your studio and think tank to make more. I am hooked and it is your fault! Ummmmm, we need more Flat Betty. Love her words of wisdom, just sayin'. Thanks so much for stopping by and I feel great... no more vertigo! I had a blast at the Creative Connection but it is good to be home and the pressure off. Love to blog and catch up! Now...I'm going to try that Palmolive Gel! Hope it works! Indeed, most men named Bubba are not worried about hair styles. I have enjoyed these stories. I can't stand to think Flat Betty will never return. Puleeze just let her come back for a reunion every now and then!!!!!!!!!! !